Queen Louise of Denmark, née Princess Lovisa Josephine Eugenie of Sweden and Norway. Born: October 31, 1851 in Stockholm, Sweden. Princess Louise of Schaumburg-Lippe (1875-1906). Prince Harald of Denmark (1876-1949). Died: March 20, 1926, at Amalienborg in Copenhagen, Denmark. Interred at Roskilde Cathedral in Roskilde, Denmark. Trivia: King Olav of Norway, Louise's grandson, mentioned that it was during the festivites for her 70th birthday that he first met his future wife as adults. Louise Bernadotte, who would become queen of Denmark and Iceland, was born in 1851 as a princess of Sweden and Norway. Her father would become King Carl XV. Her mother, Queen Louise, was born as a princess of the Netherlands. Princess Louise had a younger brother, Prince Carl, but he died as a two-year-old, and after that, she was an only child again, and she would stay that way. She could have become queen of Sweden, since she was the daughter of a king, if her uncle Oscar and aunt Sophie hadn't gotten four sons. Because she was a female, her male cousins basically threw her out of the line of succession. 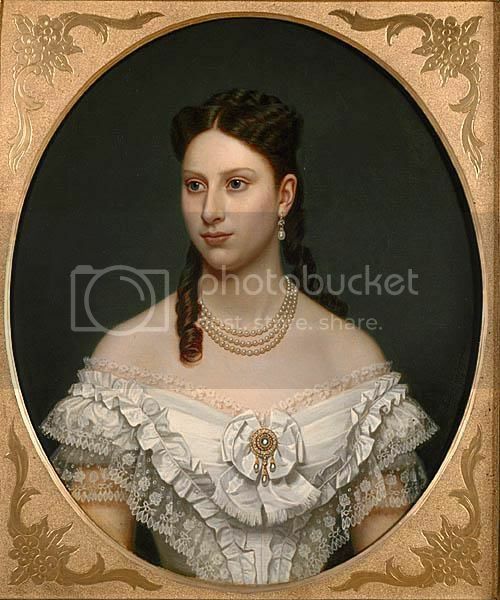 One of her uncles became King Oscar II and one of her cousins became King Gustav V. When it was obvious, that Princess Louise couldn't become our queen, she had to be planned for something else. And Frederic, the future king of Denmark, was still unmarried and in need of a suitable wife. In 1969, the eighteen-year-old Princess Louise got married to twentysix-year-old Prince Frederic, and they became the crown princely couple of Denmark. Louise's father-in-law, King Christian IX, became a very old man before he died, so Louise and Frederic were already way into their middle age, when they became king and queen in 1906. Louise's husband had now become King Frederic VIII. During their time as a crown princely couple, they had gotten eight children, four sons and four daughters. Their oldest son became King Christian X of Denmark. Their second oldest son became King Haakon VII of Norway. Their daughter Ingeborg became the mother of Märtha, the crown princess of Norway, and Astrid, the queen of the Belgians. King Frederic died in 1912, after only six years on the thrown. After that, Queen Louise was a queen dovager until her death in 1926.
its amazing how all the royal familys are so closley related !! That's because a royal only were allowed to marry another royal way into the 20th century. Harald of Norway and Albert of Belgium are first cousins, and so are Carl Gustaf of Sweden and Margarethe of Denmark. And it was very common for cousins to get married to each other too. Especially Louise's children and grandchildren were found of getting marring to their cousins! Her son Carl, the future king Haakon of Norway, was married to his first cousin Maud. His sister Ingeborg was married to her mother's first cousin Carl, which made the couple each other's first cousins once removed. And two of Ingeborg's daughters were also married to first cousins, Olav of Norway and Axel of Denmark respectively. Also two other grandchildren got married to each other, Prince Knud and Princess Caroline Mathilde. About her relationships/genealogy with other royals. You must only write who you want. In this picture Queen Mary of England really resembles Queen Louisa! Anyone else see this??? What was thier relation? Picture first posted by Magnik...from world roots? But what was there ralationships as women I don't know. So they were second cousins? And for the record Carl aka Haakons son Olav married again his cousin Märtha, the daughter of his fathers sister Märtha. I was wondering if Queen Louise had a bad relationship with all her in-laws or were there some that actually were nice to her? From what I have read most of the family mocked her and weren't exactly nice *though they didn't mind Louise's huge dowry). Did King Christian VIII and Queen Louise ( nee Pss of Hesse/Kassel) treat her well or did they have the same disdain as their daughters had? This IS Quuen Louise, Aunt Swan as she was known in the family, in later years. She was never very attractive looking. 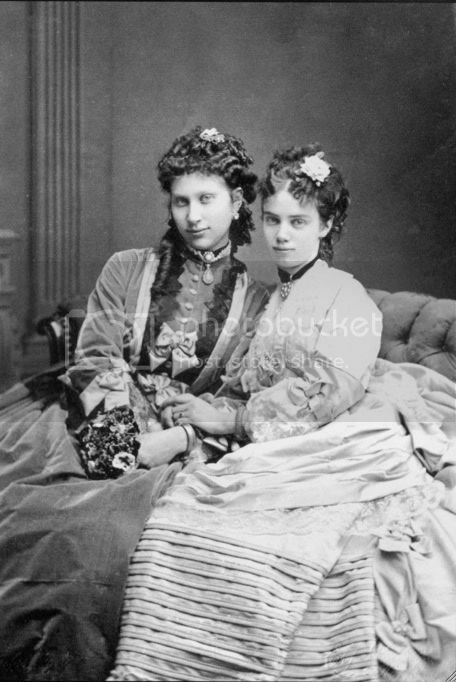 Here she is, looking quite lovely, with her sister-in-law Thyra, around the time of her marriage. NOTE: This image was posted sometime ago by a friend on another forum. It is not being originally posted by me. and with the rest of her sisters-in-law, Alix and Minny, and future husband Fred. 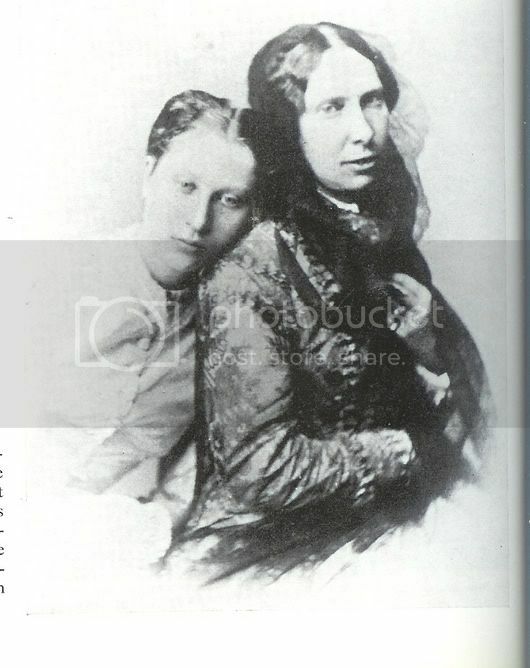 But speaking of Queen Mary...May once described her [Louise], as "a good soul, but a little queer in the head and quite difficult to get along with because she is so stiff". 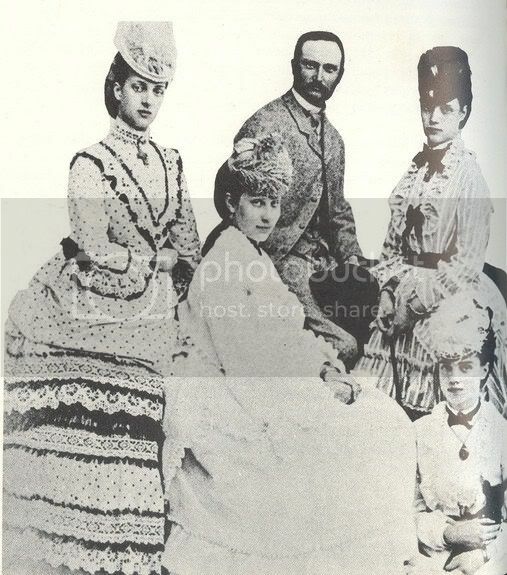 Louise was very conservative and raised her children rather strict. She never quite fit into the happy, fun-loving, Danish royal family. She lacked the strong, easy going personality they all seem to have shared as well as any sense of humor. Perhaps the fact that she was an only child had somthing to do with her inability to assimilate herself into her husband's family. Also her mother, Queen Louise of Sweden, seems to have been as rigid and boring as she was, not to mention over-bearing. I can only imagine she had quite a spartan upbringing. Unfortunatly she was the spitting image of her mother, perhaps a bit prettier though. here is also a larger version of the portrait you posted...this is my favorite image of her. Sorry they are all a bit big. Although an only child she was the only child of a king, quite rich and therefore quite spoiled, by her father at least, something that none of her husband's siblings could relate too. This obviously helped to furthur the divides between Louise and the rather clique-ish (if i may) Danish royal family. As she got older things only worsened. She became more withdrawn and isolated as her children grew. I think she was a wonderful person and wanted the best for her children and monarchy. I think it's extremly sad that she couldn't visit sweden in later life. I think that her husbands infidelity had a huge affect on her and the way she brought up her children. I am surprised that, of all people, Queen Mary was the one who had the nerve to characterize Lovisa as stiff . Lovisa did have a hard time at Denmark. Her husband showed her in every way that he only tolerated her because of her large dowry, her mother in law judged her hard on etiquette and table manner ( she was a faste eater I think and Louise didn't like that), Frederick's sisters found her too serious to deal with and once her nephews became a little older they started making fun of her too ( it was Nicholas and George of Greece who came up with the "Swan" nickname) Lovisa in her turn became very cold towards them and she often said that , of all the family, it was only Queen Olga who was actually sweet with her and seemed to show some true kindness to her. Nevertheless, I think that Alexandra and Dagmar did became friendlier to her during their widowhoods and the sorrows they faced during their last years.